Wayfair (NYSE:W), the online furniture e-commerce site, took a rare tumble after its Q4 earnings disappointed investors and missed Wall Street’s bottom-line expectations. The company, which had been barreling toward the vaunted $100 mark in anticipation of a strong quarter (though, with the weakness in Walmart’s (NYSE:WMT) online results earlier in the week, some volatility was to be expected), has taken a rare tumble and interrupted a months-long rally. Shares are still up nearly 2x in the past twelve months, but Wayfair still remains modestly valued compared against other technology and Internet peers. The company trades at just 1.3x forward revenues, far below even staid old peers like eBay (NASDAQ:EBAY). And while it’s true that Wayfair’s inventory holding model gives its revenue a lower gross margin than a pure services company like eBay (~4x forward revenues), Wayfair’s ~40% growth rate definitely merits it some sort of premium over retail names. 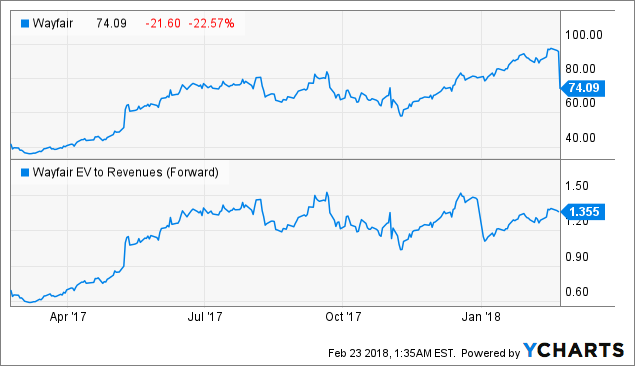 Take a brick and mortar company like Home Depot (NYSE:HD), for example, whose 2.2x forward revenue multiple still puts it at a premium to Wayfair. Certainly these comps are more profitable than Wayfair, but investors should be willing to wait on Wayfair to generate profits until it grows out of its hypergrowth phase. Wayfair’s Q4 trip-up presents a compelling opportunity to buy a stock that, despite negative perceptions this quarter, still has a bullish thesis that’s very much intact. As stated on the company’s earnings call, the major driver behind the bottom line miss was the company’s heavy investments internationally. Thus far, Wayfair has entered into Canada, Germany, and the U.K., and international revenues are up 114% this year. With the company’s business model requiring heavy scale-outs of logistics networks and infrastructure, a lot of spend has to go into generating that growth – thus the miss in the bottom line this quarter and a shortage on adjusted EBITDA guidance for Q1 relative to Wall Street’s expectations. But in the long term, these are investments that will help Wayfair scale to become a dominant player in furniture e-commerce globally (a position it claims now in the U.S.); never mind the profit impacts now. From Wayfair’s point of view, accelerated entry into international markets is something of an arms race – with international copycats of popular U.S. concepts like Uber (Private:UBER) and Airbnb (Private:AIRB) springing up all around the globe, it’s up to Wayfair to get in as early as possible. The payoff will come in due time. The crush in Wayfair shares has also re-sparked the bearish debate about the impact of Amazon’s entry into the furniture category. Walmart, too, has announced its own intentions of ramping up its furniture e-commerce arm in a bid to raise its stalling online growth. And while it would be foolish not to consider these retail giants as threats, it’s important to remember that this news can also be read as a major validation of Wayfair’s space – an area that the company entered years before these competitors. Wayfair has a huge leg up on the competition, fantastic brand recognition (thanks to the millions it spends on marketing, a point of contention with profit-conscious investors), and a well-defined customer segmentation strategy with a portfolio of brands to cater to the lower and upper ends of the market. Not to mention the fact that it’s optimized its supply chain, especially with its “Castlegate” program in which suppliers position their owned inventory in Wayfair-operated distribution centers, especially for the furniture industry. Walmart and Amazon might be big names, but they’re just getting started. Turning the discussion to the earnings results that have investors so jittery – Wayfair’s earnings, in my opinion, were just fine. With growing tech companies like Wayfair, there’s always a give-and-take relationship between revenue growth and profits. And when a company is at the head of its market and still growing ~40% despite being years in the game and at a multibillion-dollar revenue scale, it makes sense to invest in growth. Accordingly, Wayfair beat on the top line but missed on the bottom line – but it’s okay. Revenue is a much more long-term metric than a single quarter’s profits. Net revenues grew 46% y/y to $1.44 billion, beating analyst expectations for $1.36 billion (+38% y/y) by about eight points. Conversely, pro forma EPS results of -$0.58 lagged behind analyst consensus by 6 cents. Personally, I’d take the $0.06 hit for eight more points of growth. What’s important to note is that Wayfair’s gross profit has held fairly flat from the prior year at 23.1% in 4Q17 – okay, it’s down about 110bps from last year’s 24.2%, but it’s no major cause for concern. Had there been a gross margin decline on the order of 3 points or more, then we’d start to think that Wayfair’s long-term opportunity in making money from shipping furniture was getting thinner and thinner. But this isn’t true, and it’s not gross margin declines that’s the major culprit behind the EPS miss, but (as previously mentioned) additional logistics investment as well as the usual heavy sales and marketing spending. The company ramped up advertising spend 43% y/y to $165 million. It would be one thing if the company’s marketing wasn’t yielding any results, but this isn’t the case: as seen from the results summary above, customer metrics are trending extremely well. Active customers grew 33% y/y to 11 million, and orders in the quarter grew 31% y/y. Average order values also ticked up in the quarter. All this combined point to the fact that revenues per active customer also grew to $422 (in the LTM period), indicating that even though Wayfair’s customer acquisition costs might be high, they are worth it. Again, the point to be made here is a simple one: Wayfair still has a huge market opportunity ahead of it, especially when considering the fact that up to this point, the majority of the Boston-based company’s revenues have been domestic. International growth – especially when it concerns bulky goods like furniture – doesn’t come for free, and investors have to be willing to accept the tradeoffs of temporary profitability glitches in order to secure long-term growth. It’s not like Wayfair pays out a dividend that’s at risk anyway: the long-term game favors a Wayfair that achieves a much greater, global scale and a more efficient supply network. ~20% selloffs are usually reserved for truly seismic negative events, like the Equifax (NYSE:EFX) hack or the Wells Fargo (NYSE:WFC) accounts scandal. Wayfair didn’t come close to anything that tragic – it made a conscious decision, as many growth tech companies do, to focus on scale before profits. To that end, I’m more inclined to view this quarter as an opportunity to buy a fan favorite at a discount. I did the same with Arista Networks (NYSE:ANET) this quarter and will gladly do the same with Wayfair. As long as the long-term thesis is still intact and the company is still growing and dominating its market, I will buy into it despite current perception. Tech investors are notoriously fickle and follow the herd way too often. Amazon shares keep riding up to the $1,500 level and Netflix (NASDAQ:NFLX) to $300 as investors seemingly forget the limits of valuation, while much cheaper internet names like Wayfair languish waiting to be “discovered.” Should market volatility continue, it’ll be the richly-valued names that will sell off first. With its cheap valuation, Wayfair is a good hedge against a Nasdaq that has risen from the ashes of its early February pummeling. Disclosure: I/we have no positions in any stocks mentioned, but may initiate a long position in W over the next 72 hours. This entry was posted in Stocks and tagged ANET, EBAY, EFX, HD, NFLX, W, WFC, WMT on February 27, 2018 by admin. If you want to see how the funds you're invested in fare when it comes to environmental, social and governance factors, there's a rating for that.